Patrik Lindström Electro, Goth 'Dellamorte Dellamore' is the first release from Mirrors of Mind under the wings of Russian Synthematik Records after their successful demo 'Po Tonkoy Grani' in 2010. On Synthematik's homepage, they said to be similar with Blutengel, but I think that is such an evil thing to say and nothing I would lay upon even my worst enemies. Instead, I would simply say that it is electronic goth and while Blutengel is Justin Beiber for the goth genre, Mirrors of Mind is far more artsy in the whole atmosphere of its construction. It's worth mentioning that all the tracks are sung in Russian, so all the English titles are simply translations of the Russian original titles. So, here we go! To be honest, the title track is probably the least inspired tracks among the 3 original tracks on this EP. It simply feels too plain and even though the piano melodies are beautiful, I can't really say that anything is happening. I get a whole lot more out of the second track "Desolate Theatre" that have so much more depth and atmosphere to it, removing the disco beat and focusing entirely on how your emotions respond to this piece. Even the more up-tempo "Strange Dreams" have more flow to it than the title track. I recommend these two tracks. What is really interesting is the Russian translated Diorama cover of "Exit The Grey". It has been given an unique feeling of Mirrors of Mind, but still you recognize yourself of the original from Diorama, even though I don't know a single word of Russian. There's two remixes on this EP as well, two of "Dellamorte Dellamore" that I do not care much for (part from the beautiful piano in the middle of the Mental Discipline Remix). For you who pay for this release, there's a "Special Dream Version" of "Under The Veil of Eyelids" which is similar in style of "Desolate Theatre", beautiful track that could make it worth paying for instead of getting the free version. 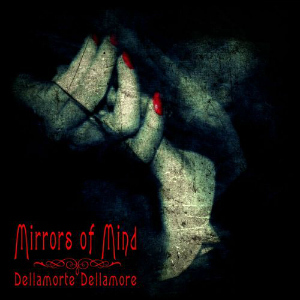 'Dellamorte Dellamore' is the first release from Mirrors of Mind under the wings of Russian Synthematik Records after their successful demo 'Po Tonkoy Grani' in 2010. On Synthematik's homepage, they said to be similar with Blutengel, but I think that is such an evil thing to say and nothing I would lay upon even my worst enemies. Instead, I would simply say that it is electronic goth and while Blutengel is Justin Beiber for the goth genre, Mirrors of Mind is far more artsy in the whole atmosphere of its construction. All and all, worth checking out and if Mirrors of Mind plays its cards right, could end up making one beautiful debut album.